Sci Rep, 2017, 7:41404. Stattic purchased from Selleck. Cell Signal, 2017, 32:48-58. Stattic purchased from Selleck. LN229 cells were treated with vehicle or the small molecule STAT3 inhibitor Stattic and analyzed for cell migration (top panel) or cell invasion (bottom panel) by DAPI staining of nuclei. Bar graphs show quantification of cell motility. J Biol Chem 2013 288(8), 5553-61. Stattic purchased from Selleck. Western blot analysis of p-STAT3, total STAT3, ABCA1 and ABCG1 levels in cells pretreated with DMSO or Stattic (10 uM) for 1 hr before and during stimulation with rDKK1 in cells transfected with STAT3 siRNA or negative control, and rDKK1 added into the supernatant. FEBS Lett 2014 10.1016/j.febslet.2014.11.023. Stattic purchased from Selleck. 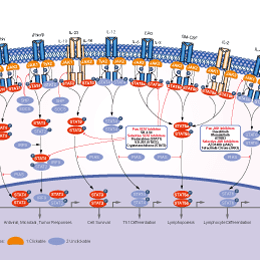 Stattic is the first non-peptide small molecule with inhibitory activity against STAT3 SH2 domain regardless of the STAT3 phosphorylation state in vitro. Schust J, et al. Chem Biol, 2006, 13(11), 1235-1242. Scuto A, et al. Cancer Res, 2011, 71(9), 3182-3188. We need to dissolve the compound for i.p. injection, could you give me some suggestions? S7024 Stattic can be dissolved in 2% DMSO/PEG 300/dd H2O at 8 mg/mL as a clear solution. 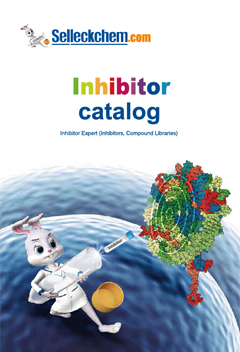 Features:A chemical probe inhibitor of Stat3 activity.